(VEN) - Norwegian Prime Minister Erna Solberg’s official visit to Vietnam from April 16-18 has contributed to deepening relations, opening new opportunities for the two countries to boost bilateral economic cooperation. (VEN) - The 26th ASEAN Summit (ASEAN Summit 26) and related meetings took place in Malaysia between April 26 and 27 focusing on reviewing and proposing specific orientations towards forming the ASEAN Economic Community (AEC) and building the AEC’s post-2015 vision. 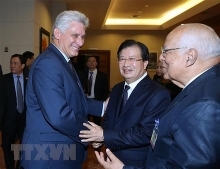 Vietnamese Prime Minister Nguyen Tan Dung led the high-level delegation to participate in a summit. Deputy Prime Minister Muhyiddin Yassin of Malaysia, which holds the 2015 ASEAN Chair, asserted the centre role played by ASEAN and its greater influence during a banquet for the bloc’s foreign and economic ministers in Kuala Lumpur, on April 25. On 23 April 2015, at the Ministry of Industry and Trade, Minister H.E Vu Huy Hoang had a courtesy meeting with H.E Konstantin Vasilievich Vnukov, the new Ambassador Extraordinary and Plenipotentiary of the Russian Federation to discuss cooperative relations between Vietnam and Russia in the coming time. The third meeting of the Vietnam-Malaysia trade joint committee took place in Kuala Lumpur on April 25, targeting measures to further intensify economic and trade cooperation. As Vietnam is integrating more deeply into the regional economy and the world economy, it has reached – or is finalizing – many trade pacts with several international trade partners, which in return makes both foreign-made goods imported into Vietnam and Vietnamese-made products exported to other countries cheaper. (VEN) - Deputy Minister of Industry and Trade Nguyen Cam Tu and an accompanying delegation visited Vientiane and worked with Laos’ Ministry of Industry and Commerce and Ministry of Energy and Mines between April 2 and 4 in order to promote trade cooperation between the two sides, especially in preparation for the signing of the Vietnam-Laos Cross-border Trade Agreement. National Assembly Vice Chairwoman Nguyen Thi Kim Ngan has affirmed support to the signing of a cooperative agreement between Vietnamese and Nepalese audit agencies to create a legal framework for implementing joint programmes. An Australian delegation headed by Deputy Governor Willem Westra van Holthe is in Ho Chi Minh City to seek ways to promote agro-aquatic collaboration with the southern city. Serious weaknesses in the lack of preparedness by businesses in Vietnam’s agro-forestry and seafood sectors threaten the realization of Vietnam’s integration into the ASEAN Economic Community (AEC) in 2015.